Priya Mani, who won a National Award for her performance in Paruthiveeran, is playing a double role in the Kannada film Charulatha. What is exciting for the actress is that she plays conjoined twins, who are joined at the abdomen. While one of the characters is tomboyish, the other is innocent, sweet and girlish. Priya Mani had to shoot for each scene twice. She had to get the body language and the traits of both the characters right every time she gave a shot. Charulatha sounds much like the English movie Stuck on You that starred Matt Damon and Greg Kinnear, but the film-makers insist that it has nothing to do with the English film. It is said to be loosely based on the Thai film Alone. Priya is upbeat about the movie and the characters that she is playing. She hopes that people who have heard about conjoined twins will want to watch the film. It will be a new viewing experience and give some insight into how conjoined twins lead their lives. Priya is cast opposite debutant Skanda Ashok. Although the crew is tightlipped about the technical details of the film, it is believed that a body double who resembled Priya was also used. It is said that a separate shoot session was done of just Priya's face that would be added to the body double. P Kumar, the director of Charulatha, made his debut with the successful Kannada film Vishnuvardhana that starred Sudeep, Bhavana Menon and Priya Mani in lead roles. 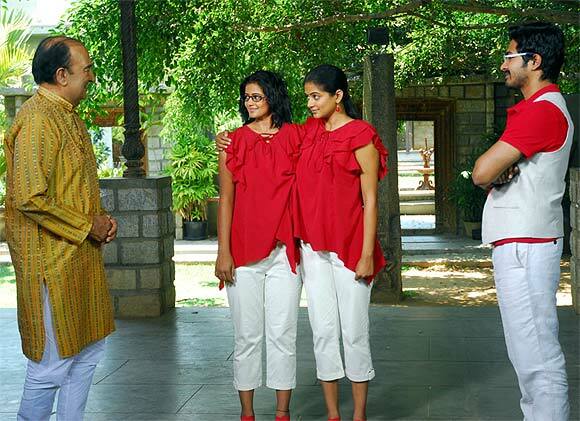 According to producer Yogish Dwarakish (son of veteran Kannada comedian Dwarakish), this is the first time that a film on conjoined twins has been made in India. He says besides the body double technique, the film uses frame masking technique, motion-cut technique and face masking to create the conjoined twins for the film. The film is being made in all the four South Indian languages. It was shot simultaneously in Kannada and Tamil. The Tamil version will be dubbed into Telugu and Malayalam subsequently. Priya Mani, who is a well-known star all over the South, will dub in all the four languages with which she is familiar. The film is titled Charulatha in all the languages except Malayalam where a film with a similar title was released two years ago. The subject seems to be hot at the moment. K V Anand is also coming out with a film on conjoined twins, Maattrraan, with Suriya in the lead!